ORICO USB 3.0 to SATA / IDE hard drive converter is a perfect solution for data transfer in the 2.5"/3.5" hard drive. This item lets you swap hard drives easier than ever before as it ensures stable external connection between any 2.5" or 3.5" SATA Hard Drive. Using its USB 3.0 Interface, you can connect any 2.5" or 3.5" SATA/IDE drive to your Ultrabook Notebook Mac or PC. - Dual-Head IDE Connector (40pin and 44pin) + one SATA Connector. - Compatible with USB 3.0 computer systems. - Supported Drives: 2.5"/3.5" SATA HDD/SSD, 2.5"/3.5" IDE HDD,CD-ROM, CD-RW, DVD-ROM, DVD+RW, DVD-RW. Supports up to 6 TB drives. - Supports most models of CD/DVD-ROM/RM drives comprising of an IDE or SATA interface on the market. - On/Off Switch for HDD protection, you can be switched off when not in using. easy and simple operation, efficiently enhances lifespan of your devices. Windows XP/Vista/7/8/8.1 (32/64-bit), Mac OS 10.10 or higher. 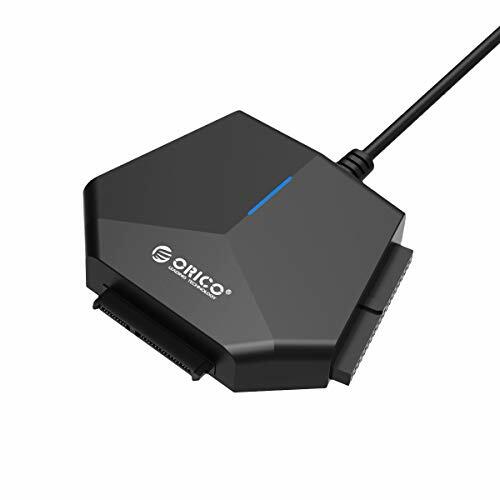 ORICO USB3.0 to SATA IDE adapter enables access to all three drives simultaneously or file transfer among the 3 drives. It has a SATA connector and two IDE connectors (40pin and 44pin). It supports 2.5 "/3.5" SATA HDD and SSD; 2.5"/3.5" IDE HDD; DVD-ROM, CD-ROM, CD-RW, DVD-RW, DVD + RW. Support 3TB single disk and up to 6TB. Data transfer rates up to 5 Gbps, backward compatible with USB 2.0/1.1. Support Windows XP/Vista/7/8/10 and Mac OS. Made of high-quality plastic material, surface treated with rubber oil, durable and good texture. Create slope design, combined with ergonomics technology, exquisite and elegant. Included 12V4A power cable for providing stable electricity supply. 4PIN Power Cable is designed for 3.5" IDE drive. Plug and play. Support Hot Swapping. On/Off Switch for HDD protection. LED light shows Power and Activity status.